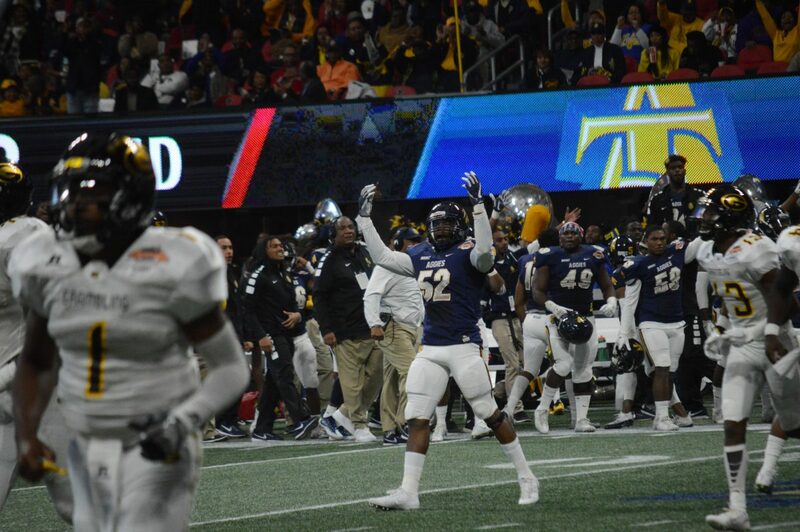 ATLANTA–It was a lot of defense early and some exciting offense late but North Carolina A&T (12-0) held on to win the 2017 Celebration Bowl, earning the title of HBCU National Champions by beating Grambling State University (11-2) with a 21-14 victory. The victory also sealed an unbeaten season for the Aggies, their first ever as members of the MEAC. North Carolina A&T seemed poised to open up the scoring on its first drive with Lamar Raynard hitting Elijah Bell on four completions. The eight minute drive stalled however with Noel Ruiz missing his first field goal attempt. Grambling came out slow with a three and out drive punting the ball back to the Aggies. It quickly became apparent that this Celebration Bowl would be a defensive showdown between these two teams. In the second quarter both defenses began to flex. Grambling’s De’Andre Hogues picked off Raynard while the Aggies were threatening in the red zone. But A&T responded quickly. On the ensuing possession the Aggies stripped Martez Carter and recovered the ball where they originally lost it. The Aggies turned that turnover into points when Raynard found Marquell Wright just behind the blitzing Grambling defense. Wright bounced in from 11 yards out for the first score of the game with 4:58 to go before the half. The Tiger offense finally got on track just before the half. DeVante Kincade put the Aggie defense on its heels with some nifty quarterback keepers which set up a wide open touchdown pass. Kincade found Jordan Jones all by himself in the end zone to tie the game at seven. A&T quickly drove down the field with 43 seconds left in the half but Grambling blocked a field goal attempt with two seconds remaining. Grambling came out strong to start the third quarter moving the ball downfield for 71 yards in nine plays. But an ill advised pass from Kincade was picked off in the endzone by Mac McCain. The Aggies then went ground and pound on Grambling capping off the ensuing 80-yard drive with a 29-yard touchdown run from Cartwright. That score put A&T up 14-7 with 7:36 remaining in the third. Grambling responded in the fourth doing what it does best, giving you the two faces of Kincade. After streaking downfield for a 25-yard run the A&T defense lost track of Martez Carter one play later. Kincade didn’t lose him, he found his tailback for a 29-yard score to tie the game at 14 all with just over 14 minutes remaining. GSU coughed up its second fumble of the game in a really bad spot when Lyndemian Brooks was stripped by the Aggies’ Sam Blue at the Grambling eight-yard line. With 9:50 remaining A&T had a golden opportunity to retake the lead but the Tiger defense stood up for an improbable defensive stand. NCAT failed to get into the endzone on four straight tries, turning the ball back over to GSU at its own one-yard line. Late in the fourth quarter Raynard would get the better of the Grambling defense. On first down from the 18-yard line with 1:01 remaining, Raynard pretended to spike the ball to kill the clock. That created enough confusion for Raynard to find Bell at the three yard line. The quarterback rushed the ball in two plays later to ultimately take a 21-14 lead with 38 seconds remaining. Grambling took some long shots at the end zone in the final minute of the game but couldn’t find any magic to get another score. Marquell Cartwright was named Celebration Bowl MVP with 110 yards rushing and two total touchdowns.